Skopelos is a Greek island in the western Aegean Sea. Skopelos is one of several islands which comprise the Northern Sporades island group, which lies east of the Pelion peninsula on the mainland and north of the island of Euboea. It is part of the Thessaly region. Skopelos is also the name of the main port and the municipal center of the island. The other communities of the island are Glossa and Neo Klima. The geography of Skopelos includes two mountains over 500 m; Delphi in the center of the island, and Palouki in the southeast. 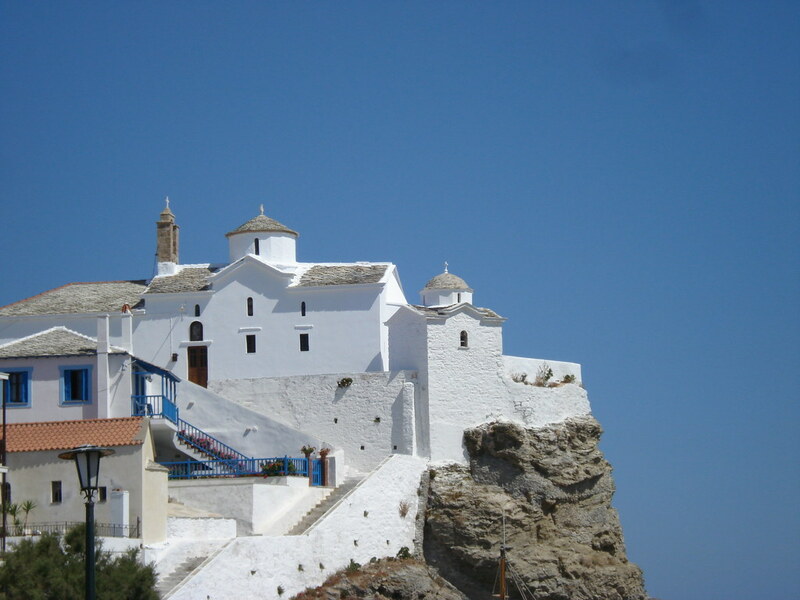 With an area of 96 square kilometres Skopelos is slightly larger than Mykonos and Santorini. The nearest inhabited islands are Skiathos to the west and Alonissos to the east. Skopelos has the shape of a saxophone, with the "neck" pointing northwest, and the "bell" lying on the east. There are not many bays and natural harbors, and cliffs steeply fall into the sea in the greatest part of the coast. Mountains dominate the western and eastern parts of the island. There are several plains; in Staphylos, Ditropon, and Panormos. The main port of Skopelos can sometimes be closed due to northerly gales. The smaller bays of Staphylos, Agnondas on the south coast and Panormos on the west offer better protection. The municipality has an area of 96.299 square kilometres. The blue markers shows the location of various accommodations in Skopelos. The letter in the marker describes the accommodation types: H for Hotel, A for Apartment, R for Resort, B for Bed & Breakfast and O for Other (e.g. pension, villa). Click on the blue marker for more information on the accommodation.